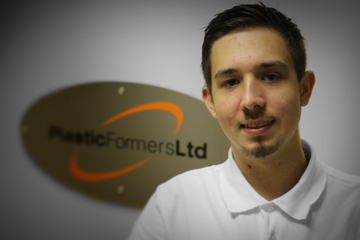 My name is Dominic Naylor and I have been working at Plastic Formers since 2013. I joined the team after being at college for 2 years doing welding & fabrication. I am currently training to become a plastic estimator and I find the work both interesting and challenging. At Plastic Formers we finish our projects to the highest of standards and to the customer’s requirements. Since working here I have found out that plastic isn’t just bottles or something you would throw away. Also every day is different and like our website says “Plastic Is Fantastic”. Please do not hesitate to contact me and I hope I can quote for any of your future plastic requirements. © 2015 Plastic Formers Ltd. All Rights Reserved.